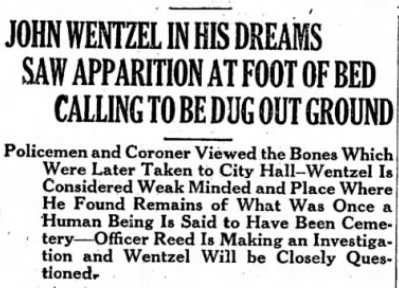 When John Wentzel discovered a human skeleton buried in the basement of his Federal Street home in Lebanon in 1926, it set into motion a bizarre chain of events that whipped the entire city into a frenzy. It is a story of a chilling nightmare-- following by a gruesome find-- that still puzzles fans of paranormal unsolved mysteries to this day. It all began in early December in 1926 when a 29-year-old man named John Wentzel began suffering from blood-chilling nightmares six years after moving into a home at 1149 Federal Street. Or, at least he thought they were nightmares-- he couldn't be sure. Night after night he saw the face of a skeleton staring at him from the foot of his bed. Perhaps even more chilling were the words spoken by the phantom skull. "The skeleton talked to me," Wentzel later told the police. "It said 'Dig me out! Dig me out! I've been here forty years and I want to get out!'". According to Wentzel, the ghostly visitations had frayed his nerves so much that his doctor, Dr. John L. Groh, had to prescribe medication. The nerve tonics helped for a while, but the medicine did not make the talking skull go away. The phantom skull tormented Wentzel for several more days until he finally decided that he had do something about it. Around noon on Saturday, December 4, he took a shovel and went down into the cellar and began digging. He hit paydirt with the first strike of his shovel, in a spot located under the cellar stairs. Fifteen minutes later, after carefully digging around the buried object, he was staring at an oblong box containing mud-covered bones. This is when Wentzel decided to report his find to the police. He called the chief of police, Harry Sealer, who rushed to the house along with Patrolman John Reed. 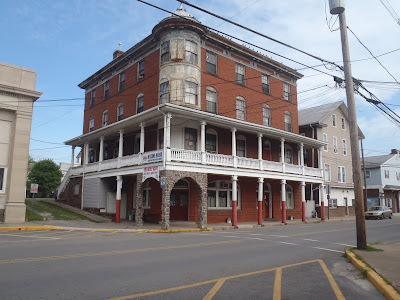 Of course, once word got out about the mystery skeleton, every newspaper reporter in Lebanon County made a pilgrimage to the house on Federal Street. He told reporters that he had often heard stories about the house being haunted. "I hear that someone was murdered here years ago," Wentzel told the Lebanon Semi-Weekly News, "and I guess it just sort of worked on my mind." Meanwhile, Patrolman Reed diligently pursued every possible lead. He obtained property records and data on every family who had lived in the house. He interviewed neighbors and some of the oldest residents of town, who told the officer that the Reformed cemetery had once been located in the vicinity, although nobody was old enough to recall just where the graveyard had been. Back then, the street was known as Cedar Avenue. Prior to that, during the 19th century, it was known as Strawberry Alley. The prevailing theory was that Wentzel had unearthed the remains of someone whose grave had been overlooked when the cemetery was relocated to a different part of the city many decades earlier. But the skeleton told a different story; a six-inch metal file was found among the bones, suggesting that a murder might have taken place. The location of the bones in the basement also suggested a not-so-proper Christian burial. There was no top or bottom to the wooden box in which the remains were found, and the box had been buried just four inches beneath the surface. On Monday morning, December 6, Coroner F. Allen Rutherford went to the Wentzel house to examine the bones. Because of the size of the jawbone and the condition of the teeth, the coroner believed that it was the skeleton of an adult female. However, the ribs, arms, legs, feet and hands were inexplicably missing. "It may be learned that Wentzel is a psychopathic subject, or one who is suffering from a mental disorder." A few days later a former resident of 1147 Federal Street came forward with her own story, which made locals think twice about questioning Wentzel's sanity. Mary Witman Snavely had grown up in the house, and continued to live there for a few years after her marriage to William Snavely. She recalled an incident from her childhood, when one morning she was startled by the sound of someone walking down the stairs. Her father was upstairs in bed at the time, and Mary was in the kitchen mixing batter for a pie. Knowing that it was long before her father's usual time to wake up, she approached the door to the stairs. As she opened the door something that felt like a cold, clammy hand suddenly emerged from the darkness and touched her brow. She screamed and then fell into a dead faint, sending the mixing bowl into the air. The clatter awakened Mary's father. He rushed down the stairs and eventually revived her. An hour after Mary told her story to the newspaper, and several hours before it appeared in print, John Wentzel told another reporter from the Lebanon Daily News that the murder occurred on November 20, 1908. Wentzel couldn't explain why that particular date popped into his head. Although Mary Witman Snavely and John Wentzel did not know each other personally and lived a considerable distance apart, it was soon learned that that was the same date when Mary, then a young newlywed, had her eerie encounter on the stairs. Amanda Witman, Mary's widowed mother, had lived at 1147 Federal Street for thirty years and stated that although she had never seen a ghost in that house, she had frequently heard doors slamming shut and felt strange winds blowing inside of closed rooms of the house. Wentzel's next door neighbors stated they had heard chains rattling from inside the house at night and had seen and heard other strange things. Another widow by the name of Mrs. Maus had lived in the house for about ten years. She recalled that, years earlier, a German family once lived there. One day the husband disappeared and was never seen or heard from again. According to Mrs. Maus, there were also many "houses of ill repute" located on Cedar Avenue during the late 1890s, and she believed that the skeleton was that of a unknown prostitute who had been illegally buried in the cellar of a brothel. Although ghost fever was raging throughout Lebanon, not everyone who lived on Federal Street believed the spook stories. One such skeptic was a man by the name of Green, described by papers as a colored delicatessen merchant and pool room proprietor who lived across the street from Wentzel. When asked whether or not he believed in the ghost stories, Mr. Green replied, "I'm kept too busy watching the live ones to give a darn about the dead ones." John Wentzel continued to have one problem, however; he was still being tormented by visitors from the spirit world. He claimed to Dr. Rutherford during the coroner's inquest that on December 7 he had received a visit from a female entity, who told him that "Sam Moore was the man who done it", and that the name of the victim was either Sarah Moore or Sarah Donmoyer. Wentzel said that the ghost told him that the girl had been stabbed through the heart with the metal file. The apparition did not provide a motive or any other additional information, but Wentzel testified that the apparition was that of an attractive woman, who announced her presence by gripping him by the neck. On the day of the inquest another peculiar detail emerged, when it was recalled that a female's skeletal hand had been discovered a year and a half earlier. It was rescued from the mouth a dog, who had dug it up somewhere and carried it to a home on Federal Street. Patrolman Reed, intrigued by the coincidence, looked into the matter, but was unable to locate additional clues. The following week, a new theory emerged about the mysterious skeleton of Federal Street after the coroner's report revealed that the bones had been buried north and south, unlike Christian burials which are traditionally made with the feet to the east and the head to the west. Some speculated that the position of the skeleton indicated an Indian burial. Experts, however, quickly dismissed this idea. Ultimately, it was concluded by the authorities that the skeleton had originally been laid to rest in the old Reformed graveyard and had remained undisturbed until the construction of the home on Federal Street (then Cedar Avenue), when it was partially unearthed by workmen who, fearing the delays such an inconvenient find would inevitably create, worked "around" the corpse without telling anyone, covering it with a thin layer of dirt after the cellar had been excavated. This, so the authorities claimed, would account for the missing top of the coffin. The bones, according to newspaper accounts, were burned and the ashes scattered in an unspecified area. As for the house that once stood at 1147 Federal Street, records indicate that it was torn down sometime in the late 1970s or early 1980s. Today, rows of nondescript apartments line the street, the tenants most likely unaware of the peculiar events that took place there in December of 1926. John Wentzel seems to have disappeared from history; some records suggest that Wentzel was not his real name (his father was an Italian immigrant, and it appears that Wentzel was the family's adopted American name), so whatever became of him is unknown. But one cannot help but wonder just how he had gained his knowledge about the skeleton buried in his basement, and who that skeleton belonged to. Perhaps supernatural forces were at play, and perhaps the messages he claimed to have recieved from a ghostly skull and a beautiful female apparition really did hint at an unsolved murder that happened long, long ago. Did John Wentzel See the Ghost of Josie Mackay? As stated earlier, Federal Street was known as Cedar Avenue in earlier times, and was the site of many notorious brothels. During the coroner's inquest, Wentzel testified that he was visited regularly by the ghost of an attractive young woman who told him that the murder victim was named "Sarah Moore" or "Sarah Donmoyer", and that she was killed on November 20, 1908. While my research failed to turn up any suspicious local deaths on that particular day, I did uncover some information about an unfortunate young prostitute named Josie Mackay who died of a self-inflicted gunshot wound in 1902, just a few feet away from the Wentzel house. Josie Mackay was born in Lewistown, and relocated to Cedar Avenue in Lebanon in the spring of 1902, working under the alias of "Goldie Croff". Shortly before one o'clock on the afternoon of May 24, she shot herself in the heart in an outbuilding at 1127 Cedar Avenue. Since the houses of the era were most likely row homes, it stands to reason that the location of this outbuilding was just a few steps from the Wentzel house. There were two rumors surrounding Josie Mackay's death-- one rumor maintained that she was a morphine addict, the other speculated that she had fallen in love with a man who later abandoned her, identified as Harry Welsh, a train conductor from Paxtang. The other girls who shared the house stated that as soon as Welsh took his leave, Josie took a revolver and went out into the back yard. Marie Harris, another girl who resided at the brothel, followed her into an outbuilding but became scared that Josie might turn the gun on her. She heard the gunshot before she reached the house and turned around just in time to see Josie staggering into the yard, where she collapsed. Josie was rushed to the Good Samaritan Hospital. She did not lose consciousness after the shooting and was able to answer questions. She revealed that she had arrived in Lebanon from Harrisburg, where she had been in jail for shooting another woman. 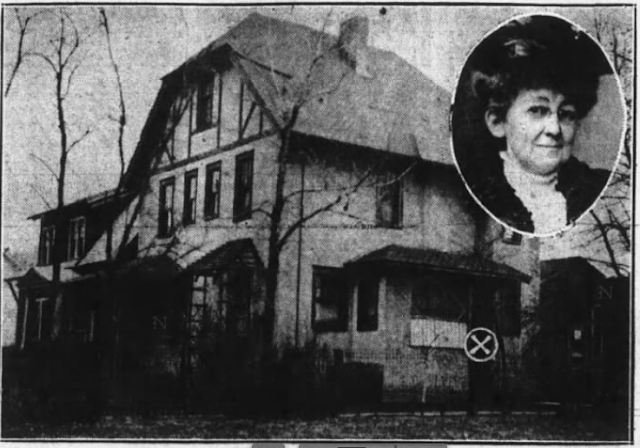 She had no parents or relatives, but lived in the Cedar Avenue home with three other females and the madame of the establishment, Mrs. Sallie Burgner. After doctors removed the bullet from the 24-year-old woman's chest, her condition began to deteriorate. She died on May 30, and was buried at Mt. Lebanon Cemetery. Could this have been the woman John Wenztel saw in the form of a ghost, telling him where to dig? It seems that we may never know the answer to this chilling mystery.